Got a PM asking for the decoder ring to a couple photos I did. This is based on a 68 S code manual GT. Could not find the original post. Any corrections or clarifications appreciated, can amend the list if needed. 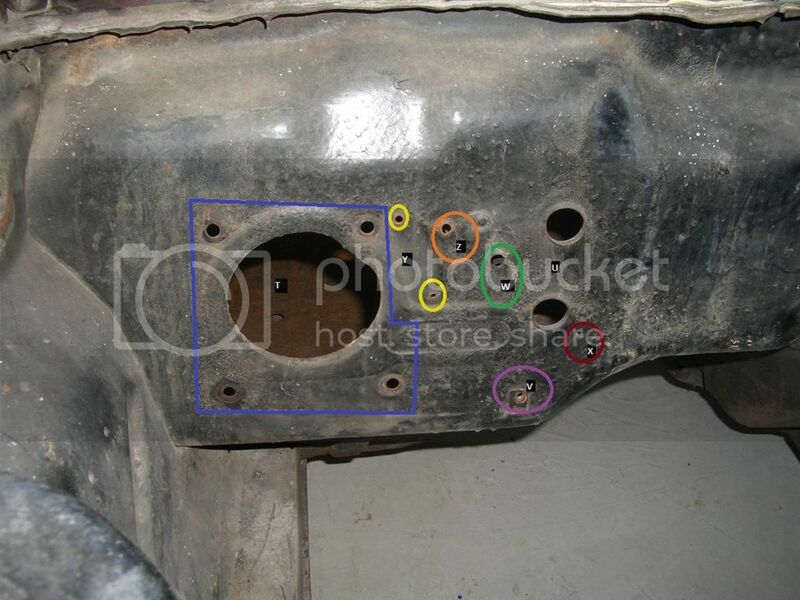 Last edited by dalorzo_f; 01/02/2016 at 05:54 PM..
Last edited by dalorzo_f; 01/14/2016 at 09:31 PM..
On an AC car the horizontal punch-out plate, to the right of the huge hole on the left, will be open. I think the two heater hose holes will be closed, but I'm not sure - they may have rubber plugs in them. Ah ha, I found a photo. They appear to be rubber plugs. Yep, and 6 cylinders will have different items. And manual vs clutch differs (hole F will be closed on a automatic car). Have updated the initial lists. The level of information from this site is amazing!! You guys never cease to amaze me!! A/C photo: The 2 heater hose holes ARE used on an A/C car. Just different hose routing. Thanks Rob, coming from you that is a high compliment. I thought the non-AC heater holes were blanked off with rubber plugs on AC cars. 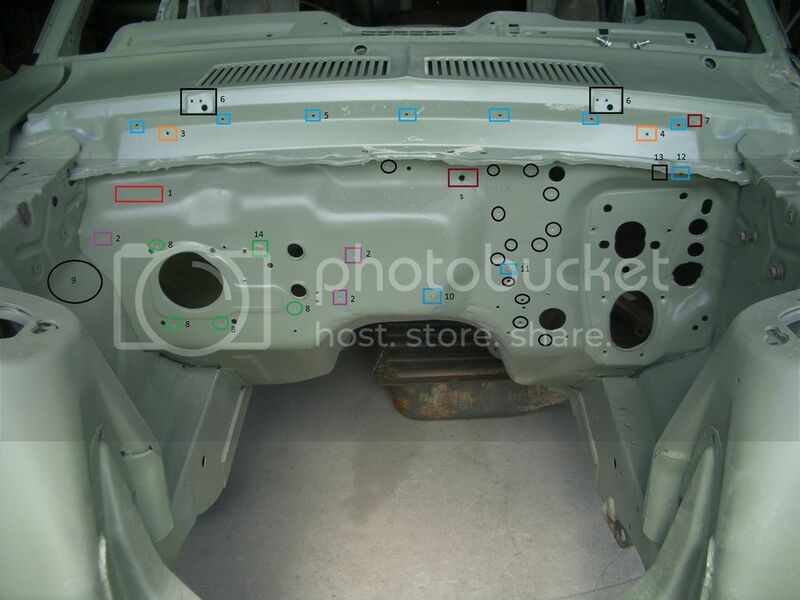 The heater core in the AC box has connections thru the optional oval punch-out, and the evaporator connections go thru where the heart motor sits on a standard heater optioned car? 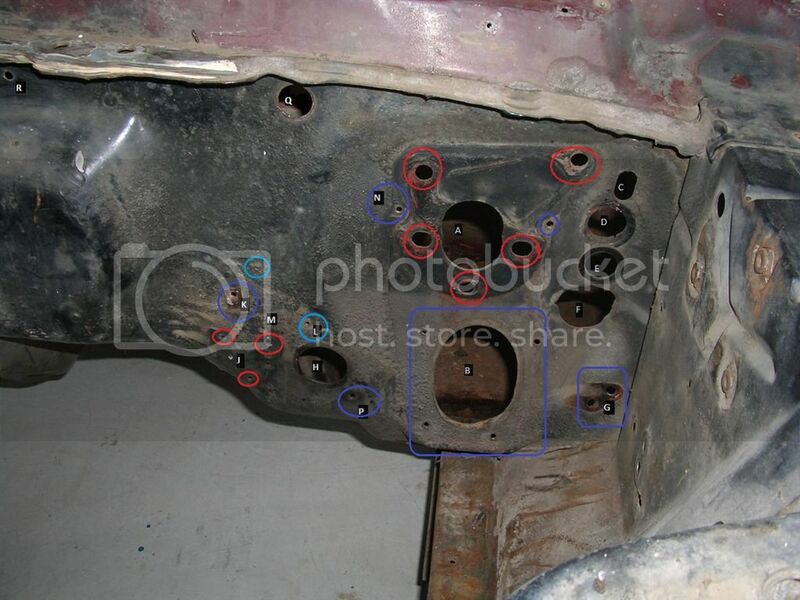 I think in your photo you can see the unused original heater holes behind the transmission dipstick? #4 is used for hood signal wire mounting on a San Jose cars. 13 is used on Dearborn and Metuchen cars. There also is a dimple in the #1 aria for a vacuum hose support bracket on AC cars. Yep, the holes behind the dipstick are the heater hose holes. Item 4 updated.... thanks! I found that in double checking my own phots once you mentioned it! Now to fix the GT/CS, S convertible and GT coupe... all San Jose and I did them wrong!!! And I am unsure if S is firewall pad or a option wiring port... and the pad is the one to the left. Oh MY GOD!!! I bow to the information on this subject. And Richard that is a huge compliment to me who does not deserve such high praise!! Not in the concurs world that you guys are amazing in! Way to preserve and authenticate our hobby guys!! It's like the gods have spoken because I really needed this information myself.